Las Vegas – The public is invited to experience the wonder and extravagance of Circus Couture’s “PRYSM”, a circus, fashion and art event inside The Joint at the Hard Rock Hotel & Casino Las Vegas on Friday, September 29, 2017. “PRYSM” is about much more than highlighting the incredible talents of local circus performers, fashion designers and artistic creators. It is a community-based philanthropic effort to meet the need of Nevada’s most vulnerable young warriors who are facing a battle for their lives. Now in its 8th year, Circus Couture has benefited the Children’s Specialty Center of Nevada, the state’s only nonprofit outpatient clinic treating children with cancer and many other catastrophic childhood diseases. The mission of the Children’s Specialty Center of Nevada—and its parent organization Cure 4 the Kids Foundation — is that no child facing a life-threatening condition be turned away from treatment for financial reasons. Circus Couture is an incredible event that illustrates the power of a close-knit community as it supports local families in need. 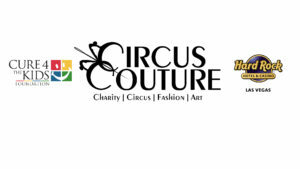 The inspiring entertainment presented at Circus Couture is made possible entirely by Las Vegas artists, performers, fashion designers and technicians who have participated in many of the world famous shows based on the Las Vegas Strip. All performers donate their time in an effort to elevate the overall health of the community in which they live and work. Co-founded by noted aerialist Erica Linz, star of Cirque du Soleil’s Worlds Away, Circus Couture events have raised more than one million dollars to date in the fight against childhood cancer and for the benefit of Nevada’s children. Tickets for Circus Couture’s “PRYSM” may be purchased immediately online: http://bit.ly/2wUNXdb. Tickets start at $35. VIP table reservations may be made by contacting VIP services at dmbernhard@cure4thekids.org or by calling 702-732-0952. Live Auction/Main Events: 8:30 p.m.